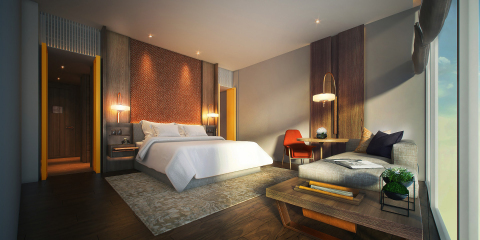 CHICAGO--(BUSINESS WIRE)-- Hyatt Hotels Corporation (NYSE: H) announced the opening of Andaz Singapore, the first Andaz hotel to open in Southeast Asia. Andaz Singapore furthers the brand’s mission to create inspiring, indigenous experiences that immerse guests in the local culture of each unique destination. The hotel marks the seventeenth property for the brand and joins other Andaz hotels in global gateway cities and top resort destinations around the world. Visit the new Andaz Singapore and enjoy 20 percent off all guestrooms and an additional 3,000 World of Hyatt bonus points (per stay, with a minimum of two nights booked)*. For more information, please visit singapore.andaz.hyatt.com. Andaz Singapore can also be found on Facebook, Instagram and Twitter. *Terms and Conditions: Offer valid for a discount of 20% off the Hyatt standard rate for reservations made in advance between August 15, 2017 and January 31, 2018 for stays lasting two or more nights that occur between December 5, 2017 through April 30, 2018 at Andaz Singapore. Must select “GPTR” rate and provide a 1-night non-refundable deposit at time of booking to qualify for discount. World of Hyatt members who provide their membership number, are a registered guest of the room and who otherwise qualify for this offer will also receive 3,000 Bonus Points. Bonus Points do not apply to consecutive bookings. Reservations subject to availability. Offer not valid with groups, conventions, other promotional offers, tour packages or special rate programs. Rate excludes, unless specifically noted, service charges, mandatory resort fees, applicable taxes and other incidental expenses. Additional charges may apply for additional guests or room type upgrades. Offer not valid in conjunction with previously booked or held stays. Not redeemable for cash or other substitutions. Any unauthorized transfer, sale, distribution or reproduction constitutes fraud. Points will be credited to member’s account 6 to 8 weeks after stay is completed and paid for in full. Offer subject to the complete terms and conditions of the World of Hyatt program. Promotional blackout periods may apply due to seasonal periods or special events, and normal arrival/departure restrictions apply (unless otherwise noted). Hyatt reserves the right to alter or withdraw this offer at any time without notice, where required, Hyatt will offer an alternate offer of similar value. Void where prohibited by law. Hyatt, World of Hyatt, Andaz and related marks are trademarks of Hyatt Corporation and/or its affiliates. ©2017 Hyatt Corporation. All rights reserved.